We took advantage of some recent gorgeous weather to paint outdoors. 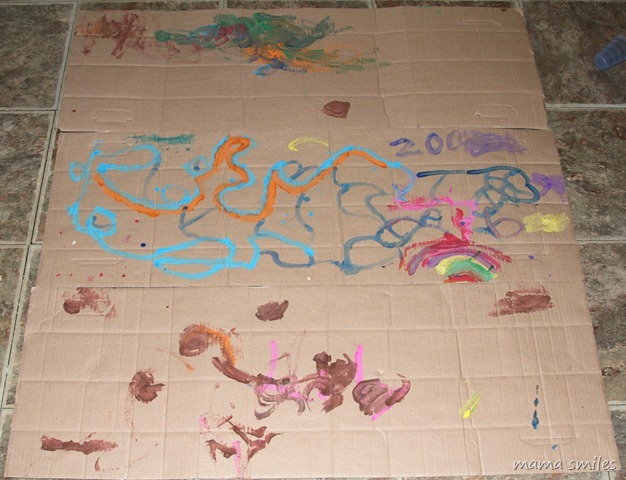 I gave each kid a sheet of cardboard, and they spent a lot of time painting. Emma knew immediately that she wanted to make some roads, and she stayed focused on that theme throughout the project. 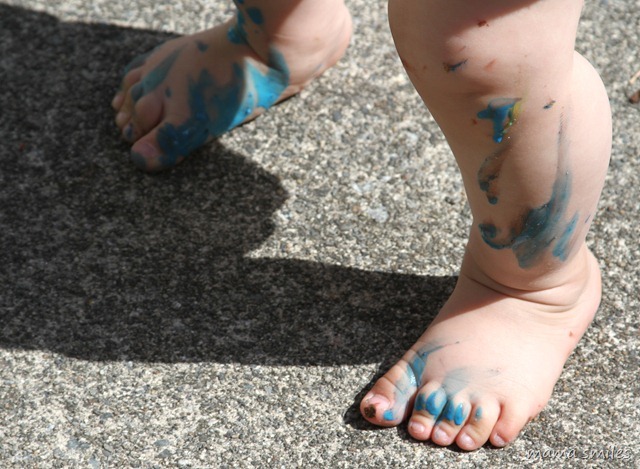 Lily painted her hands and feet – but, impressively, not her face or mouth! Johnny moved on to all sorts of different canvases. What are your favorite ways for kids to learn and explore art? How’d your husband react to the “creative canvas?” Mine would have been freaking out. .-= Ticia´s last blog ..The MEAN Mommy returns =-. @Elisa – Thank you! Johnny is extremely proud of his ornamental art – wonder how he’ll react when the rain washes it all away? Your husband is a saint :) I love the picture of Lily’s feet – what a great memory. They all did great. .-= Natalie´s last blog ..Money- Money- Money… =-. That first photo is so precious: three very young artists simultaneously at work! So cool that Emma’s art is also functional, Lily’s is wearable, and Johnny’s is ornamental. .-= Elisa | blissfulE´s last blog ..celebrating Nikki =-. I LOVE Johnny’s canvases:-). Lily’s feet and legs are absolutely adorable! Super that they are enjoying this after their painting it. This is a wonderful idea, very fun!! .-= Susana´s last blog ..Some Changes in Our New School Year =-. .-= lynn´s last blog ..Weekly Wrap-Up Homeschooling the Infant Bibliophile- with Free Printables =-. Oh my, you have been having a lot of fun with your baking, science experiments and al fresco painting. It cracked me up when you said that Johnny moved on to different canvases. I laughed because I imagine my little boy having a ball and doing the same thing. I love the picture of Lily with her painted leg and feet – very cute. How wonderful for Emma to be able to use her creation and share the fun with her brother (and maybe with Lily too). Now that it is Spring here I will have to make sure we also get outside and paint. There are so many sources of inspiration outside and a change of scenery is always enjoyable. 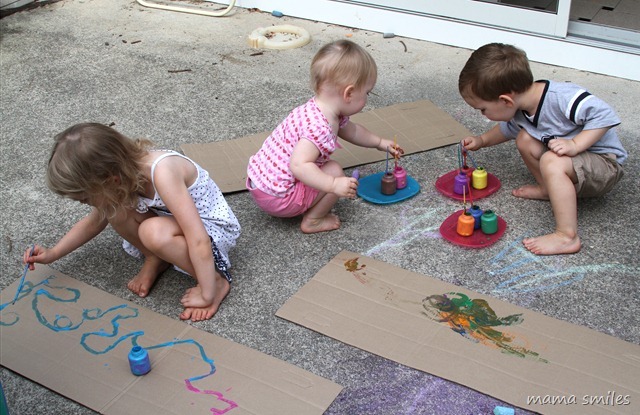 Cardboard is such a great art material and I love that it is eco friendly and FREE! 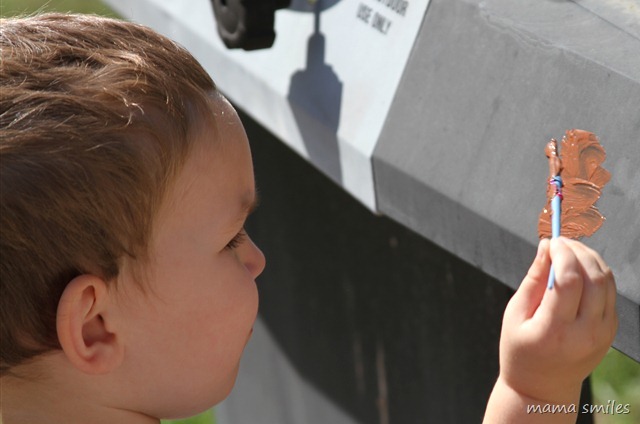 If you don’t mind, could you share this at our Outdoor Play Party. Thanks! Love using recyled materials to paint with, I have also seen people use cardboard show box lids in same way as you would a canvas. Thanks so much for adding this to the outdoor play link up this week.